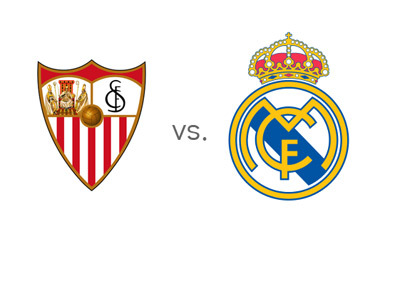 The upcoming game between Sevilla and Real Madrid is big for many reasons. Sevilla are fifth in the Spanish La Liga standings and they are battling for a spot that qualifies directly to the UEFA Europa League next season. They won their last five league games and are in the quarter finals of the UEFA Europa League, having eliminated Real Betis in a thrilling second leg match that went to penalties. Real Madrid's 30+ game undefeated streak just ended on the weekend at the hands of Barcelona in an epic El Clasico league match. The battle at the top is as tight as ever this season and this is a must-win game for Los Blancos. Every game for the rest of the league season is actually a must-win for Carlo Ancelotti's men. Real Madrid are second in the standings, in the quarter finals of the UEFA Champions League and in the final of Copa del Rey. The best thing about the upcoming match between Sevilla and Real Madrid is that their last encounter at the end of October, at the Bernabeu, was one of the best games of the season. Real won 7-3 in the end, but it was a lot closer than that. After losing to Barcelona on the weekend, Ronaldo and Co. will probably go 1000% on Wednesday. Sevilla, on the other hand, are riding an awesome wave right now and they just might have something to say as well. Real Madrid are the heavy favourites to win. The kick-off is at 10pm loal time.